But scientists in California think small is beautiful. They want to build an accelerator on semiconductor chips. An accelerator built that way won’t achieve the energy of its much larger cousins, but it could accelerate material research and revolutionize medical therapy. “An accelerator is a way to add energy to particles,” says Robert Byer, a physicist at Stanford University. Once you have those energetic particles, you can do things with them, like irradiate tumors or generate X-rays that scientists use to investigate new materials. An accelerator built this way would bring an accelerator’s usefulness within the reach of more researchers. Byer has been trying to shrink the size of particle accelerators for more than 40 years. His idea is to use lasers to add energy to electrons as they zip through a tiny channel in a semiconductor chip. Byer says this is a miniaturized version of what goes on in larger accelerators, but there are big challenges to doing this on such a small scale. Byer and his colleagues are working on those challenges in a laboratory in the basement of the Spilker Engineering and Applied Sciences building on the Stanford campus. Byer took me on a tour there. We put on glasses to protect our eyes from the powerful laser light used in the pint-sized accelerator. Lasers are key to adding the energy needed to accelerate the particles, and powerful lasers require powerful stop signs. This emergency shut-off button can quickly cut the electricity to the Stanford lab’s lasers. Courtesy of Dylan Black. A big red emergency shut-off button attached to a shelf suggests this is not equipment to trifle with. Peter Hommelhoff of the Friedrich-Alexander-Universität Erlangen-Nürnberg in Germany says one of the big challenges is to keep the electrons in the accelerator traveling where you want them to. “The acceleration channel is very narrow, so you have to generate a very, very narrow electron beam that you can send through the channel,” Hommelhoff says. 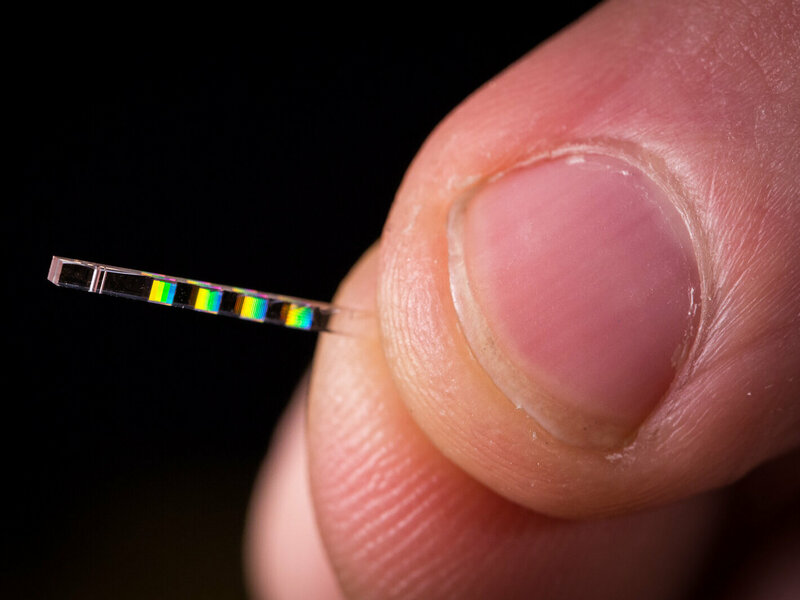 “It’s a little like threading an invisible needle,” says Dylan Black, a Stanford graduate student in physics. Testing their accelerator requires lasers and lenses and pumps scattered around benches in the lab, it takes up a fair amount of space. But this is just a prototype. Black points to a bright circle of light on a monitor’s screen. “That there is a picture of what the electron beam would look like if you put your eye right in front of the beam,” Black says. “Which I would not recommend,” interjects Ken Leedle, a research engineer working on the accelerator-on-a-chip project. I asked R. Joel England, a physicist at the SLAC National Accelerator Laboratory who has been working on the accelerator-on-a-chip project, how long it will be before the prototype turns into a working instrument. “Depending on how much progress gets made, I would say five to 10 years,” England says. England is enthusiastic about the promise of these small-scale accelerators. “One of the applications could be to take one of the fairly bulky, 10,000-pound accelerator devices that’s used in hospitals for radiation therapy and make that into something that’s chip-sized,” he says. In addition to saving huge costs and space, it might eventually be possible to insert a chip-sized accelerator into a patient’s body, where it could directly irradiate a tumor. Even though it may take a decade or more, Robert Byer is convinced smaller accelerators will become a reality. His isn’t the only lab working on the idea. And besides, he points out, new technologies often start out bulky. Take the first laser to come on the scene. Even new mobile phones have lasers in them, Byer says. The day of the accelerator on a chip, he believes, is coming.